Microsoft Corp. (Nasdaq: MSFT) stock is poised for a boost in 2014 now that the company has officially named Satya Nadella as the new CEO. Nadella will replace Steve Ballmer, whose long tenure at the helm of Microsoft was marked by miscues and missed opportunities that left Microsoft stock flat for more than a decade, though it did follow the markets higher in 2013 with a 40% gain. Part of that gain in MSFT stock came, however, following Ballmer's announcement that he would leave the CEO post. In addition to the news on Nadella, Microsoft also said founder and former CEO Bill Gates is stepping down as Chairman of the Board, though he will remain a member of the board along with Ballmer. Board member John Thompson, a former International Business Machines Corp. (NYSE: IBM) executive and former CEO of Symantec (Nasdaq: SYMC), will become Microsoft's new chairman. Thompson has asked a lot of tough questions since joining Microsoft's board in 2012. A 22-year veteran of Microsoft, the 46-year-old Nadella faces a full slate of challenges right out of the gate. Despite its success, Microsoft continues to rely heavily on the profits of its two flagship products, Windows and Office. The company is still trying to catch up on the mobile revolution of smartphones and tablets that has eaten into sales of traditional PCs and the Microsoft software that runs on them. Nadella will need to overcome the mistakes of the past while setting a bold new direction for Microsoft, but will need to do so with both Ballmer and Gates sitting on the board. "We do not want to see a continuation of the existing direction for the business, so it will be important that Mr. Nadella be free to make changes," Nomura analyst Rick Sherlund wrote in a note Friday. Most recently, Satya Nadella has served as president of Microsoft's server and tools division. 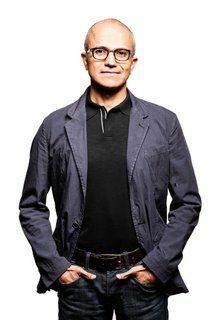 An Indian-born engineer with degrees in electronics and computer science, he graduated with an MBA from the University of Chicago Booth School of Business and began working at Microsoft in 1992. Over the last 22 years, he's held leadership roles in cloud services, Internet search, server software, and Windows business applications. Under Nadella, Microsoft's cloud business has gotten much more traction – a prime reason he rose to the top of the list of CEO choices. Nadella has successfully launched a number of projects within Microsoft, including BizTalk, Microsoft's Commerce Server, and Microsoft's Office Small Business products. But his chief achievements have come as a leader of recent online projects. He was responsible for transforming a failing Windows Live Search product into the search engine Bing, which has been growing market share in the struggle against the mighty Google Inc. (Nasdaq: GOOG). Nadella isn't perfect. He's never been a chief executive and has little experience with the company's consumer products such as the smartphone, personal computer, and gaming lines. As an outside observer and not knowing a thing about Nadella, a concern may well be a situation of "Legacy of Microsoft" which means little to no experience of the outside world. Ballmer came with a similar experience and believed Microsoft could do no wrong (which is a curse no company should have). Ballmer's missteps are now well documented. Microsoft is a behemoth that I'm not sure even Gates could lead adequately today. Remember he led the company when Windows and Office were the products. It's difficult for one person to handle too many branding irons when all are hot. Engineering is important when the product(s) have a mote of superiority like the original Windows. As products become commodities then the real challenge begins. Even giving "stuff" away for free doesn't always work. Gates was either very astute or lucky (maybe both) when he stepped down from day to day operations. Nadella won't get a long honeymoon; Mr Market is not a patient suitor!